There are some trends that are versatile and wearable, and there are trends seemingly made to shock us. The latest controversial shoes on the scene fall securely into the latter category. My fellow Who What Wear editor Anna LaPlaca just brought to my attention Stuart Weitzman's new Duvet Boots, which pretty much look exactly how they sound, although I would've named them Puffer Boots, as they look like quilted puffer jackets for your feet—but I digress. "Designed for a distinctive pillowy effect," the brand describes, the boots "will instantly elevate any outfit" and are best paired with skinny jeans or a miniskirt. At first glance, it seems that the number one thing the Duvet Boots have going for them is warmth (they're lined in shearling), followed closely by comfort (because duvets are comfortable), but I can't imagine we'll see them out in the world too much outside of the fashion week crowd and/or a few celebrity cameos. (Reminder: Celebrities love Stuart Weitzman.) Plus, something as attention-grabbing as this is usually a one-season wonder. My verdict is that if you have this much money to spend on a pair of boots this memorable, keep the rest of your look simple and stick to simple, dark-wash skinny jeans and a sweater or T-shirt. Whatever you do, please don't wear them with an actual puffer jacket. 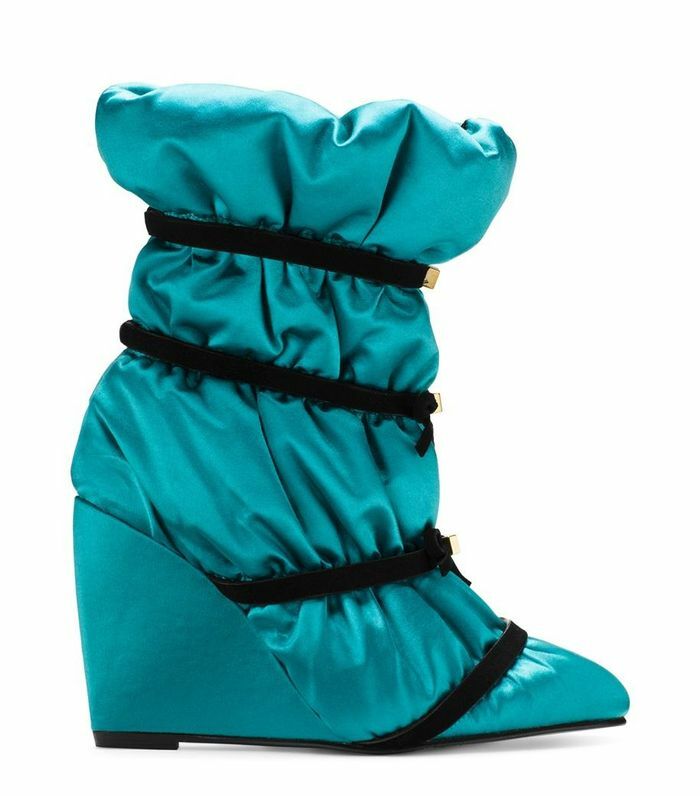 If you dare, preorder Stuart Weitzman's Duvet Boots in every color below, as well as other, more wearable boots, from the brand's crop of new arrivals. I'm loving this wraparound lace detail. Day or night, these are perfection. The most polished combat boots ever. I'm not 100% sure what to wear these with, but I'd like to figure it out. I'd like to conquer the winter season in these. The best sock boots on the market, in my opinion. You probably have feelings and questions too, but I hope I answered some of them for you.